When creating a microcontroller devices periodically there is a problem of regulation of some of the analog value, such as voltage at the IC pin, LED brightness, power, etc. In order to form an analog signal with a given amplitude at the pin of chip commonly used method of pulse-width modulation - PWM. The basis of the PWM output is on pin IC pulses with varying duty cycle. When programming microcontrollers sometimes there is a problem of calculation of math functions. And despite the fact that the standard AVR GCC library includes support for float numbers and basic math calculations, in practice is not always possible to use these routines. 8- and 16-bit game consoles that were a long time ago very popular, has long lost its leadership in gaming and entertainment market. However, the old games are still popular and yet are perfectly competitive of the interestingness with the modern multi-gigabyte and multi-gigahertz monsters. 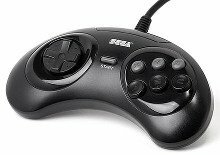 Today there are many different emulators of old consoles and the Chinese industry is still produced a console itself as well as joysticks to them.